Courtesy of Rhoda E Gazda ABR, Keller Williams Advantage Real. Wow! Completely remodeled from top to bottom. Step inside and discover an efficient, open floor plan! Spacious living rm opens into kitchen and dining area. 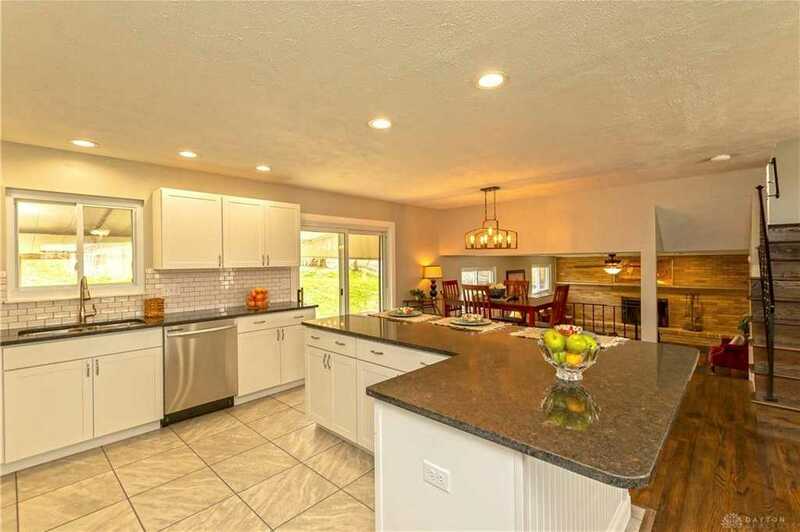 Gorgeous kitchen features white shaker cabinets, granite counters, subway tile backsplash and new ss appliances. Hardwood floors throughout main & upper level have been refinished with a darker stain. Upstairs are 3 spacious bdrms and full bath. Lower level has daylight windows & boasts a family rm w/trendy shiplap, wb fireplace (new liner), 4th bdrm & laundry rm/full bath. Even more space awaits you in the finished basement w/full bath and waterproof vinyl wood look flooring. Outside the new buyer will enjoy the large covered patio. Add’l updates include: new roof, electric panel, flooring, appliances, lighting, ceiling fans, paint, baseboards, interior doors, garage door, new front door. Please, send me more information on this property: MLS# 787934 – $230,000 – 5812 Helenwood Drive, Riverside, OH 45431. I would like to schedule a private showing for this property: MLS# 787934 – $230,000 – 5812 Helenwood Drive, Riverside, OH 45431.